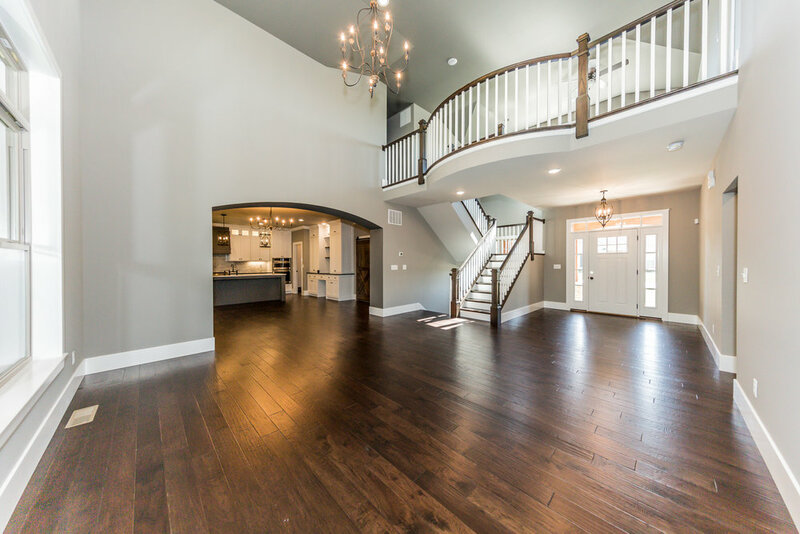 Built by Rich Gorazd of State Construction and located in Bethel Ridge Farms, O’Fallon Illinois newest executive subdivision, is an absolutely stunning 4-bedroom, 1.5 story, completely custom, 4,200 sf home. 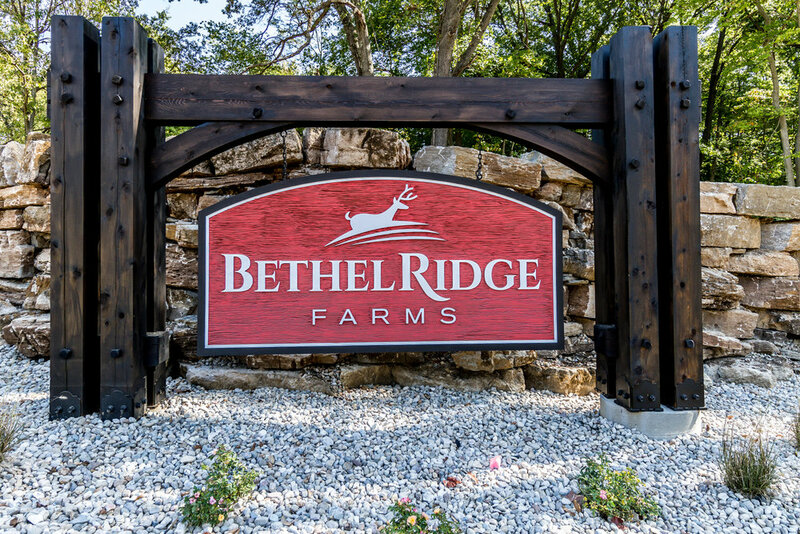 Bethel Ridge Farms Lot 22 showcases a private backyard with professional landscaping, retaining walls, mature trees and access to a creek with streaming water. 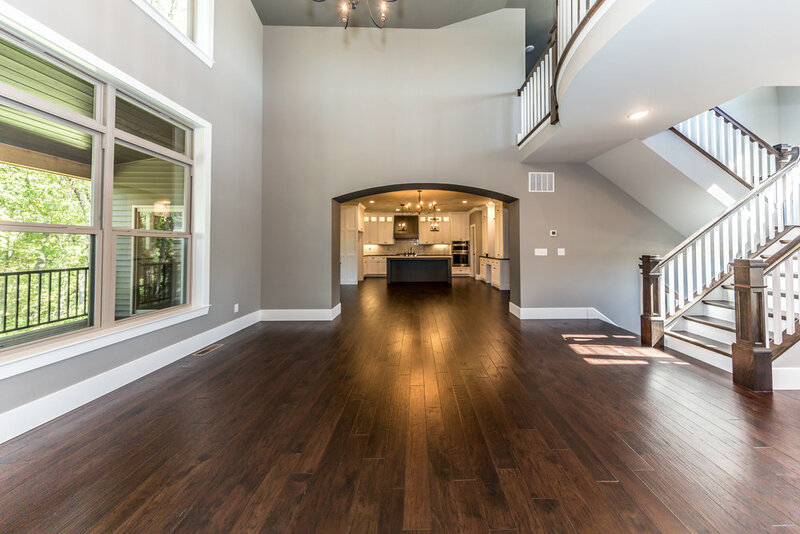 Engineered Hardwood Flooring runs throughout the open main level including the Foyer, the Great Room, the Kitchen and the Hearth Room. 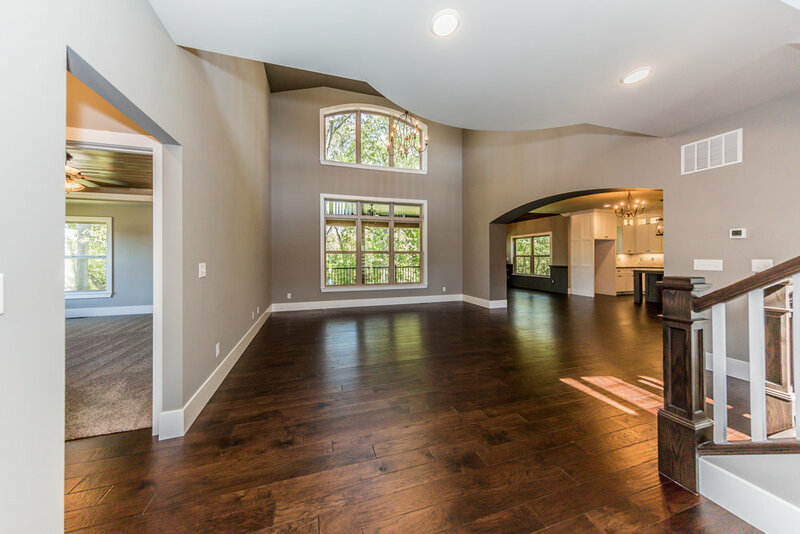 The 2-story vaulted Great Room features a wall of windows which allows lots of natural light throughout the main level. The Great Room flows into a tailored Eat-in-Kitchen which offers a large Breakfast Area and a Pullout Beverage Center with a Keurig Organizer Drawer, Wine Rack and Liquor Pullout. 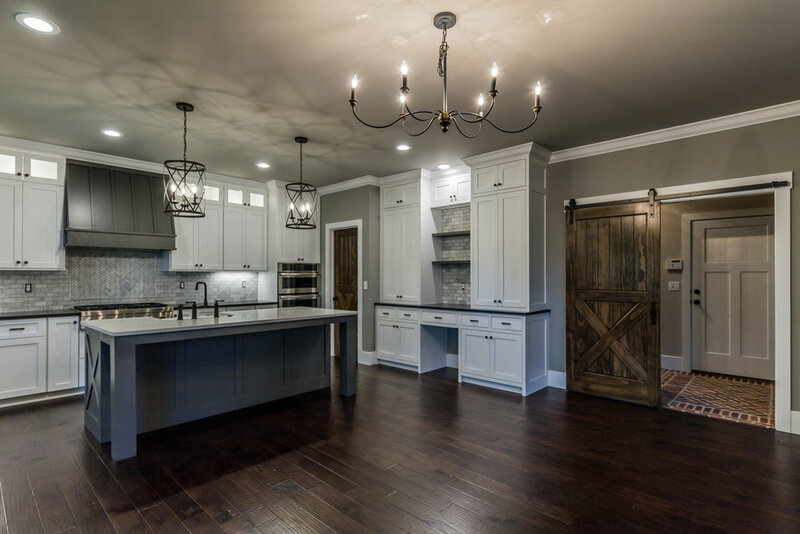 The Custom Built White Shaker and Espresso Cabinetry features soft close doors and drawers as well as upper cabinets with glass door fronts. The Oversized Espresso Island has a Quartz Countertop with an overhang, which allows for additional seating. 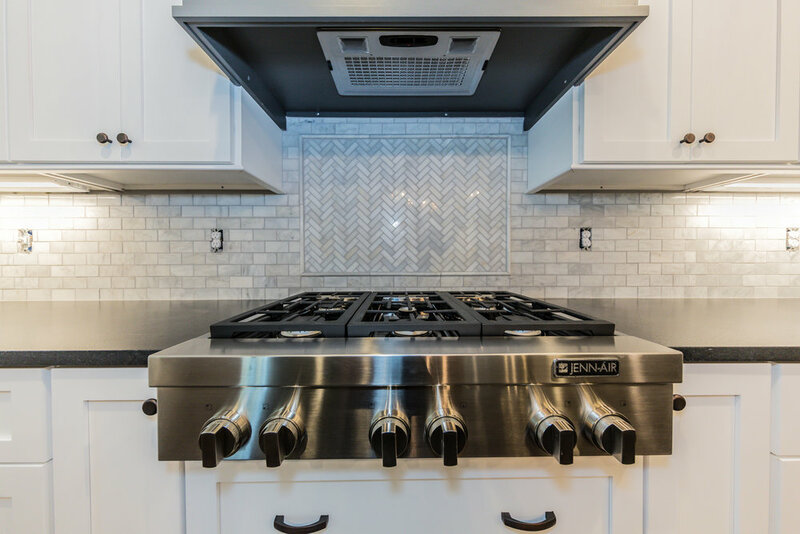 The Perimeter White Shaker cabinetry has Granite Counters, Custom Backsplash, an Apron Kitchen Sink with an upgraded kitchen faucet, under cabinet puck lighting as well as a Designer Hood and Jenn Aire Appliances. 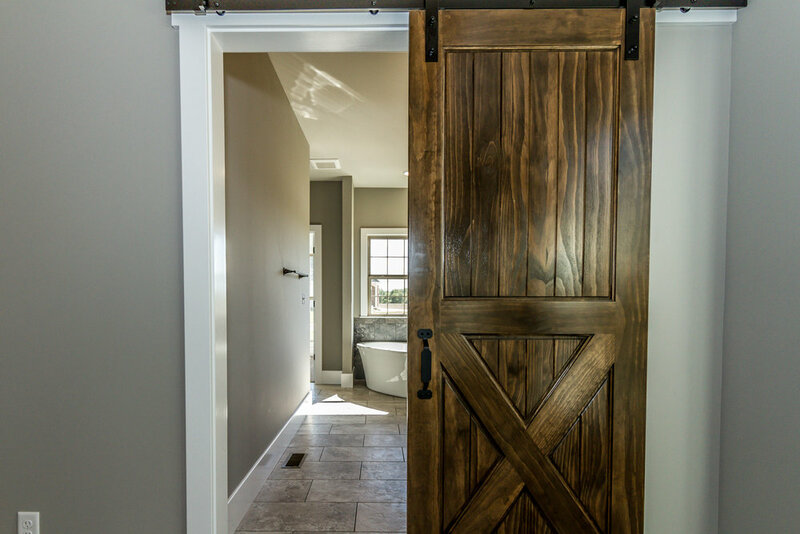 A very distinctive Mud Room is located just off the kitchen and features a sliding wood Barn Door, unique Brick Paver Flooring as well as Full Height Lockers with black Grid Doors, Rustic Pine Tops and Charging Stations with wiring for USB ports. 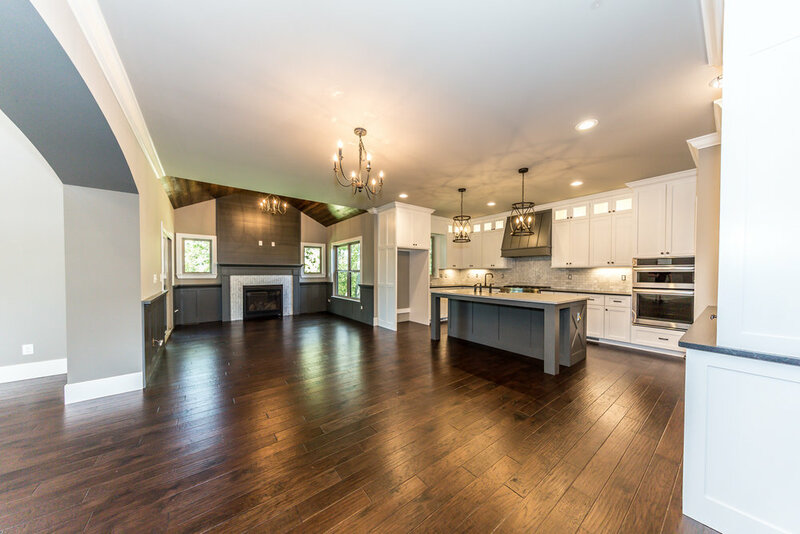 Enjoy reading a book or morning coffee in the sophisticated Hearth Room, which is just off the Kitchen, and has wainscoting on the walls, a Wood Pine Ceiling, a Fireplace with a Back-Splash surround and Wooden Shiplap above the Mantel. Just off the Hearth room is a Covered Deck which overlooks the wooded backyard & creek and is perfect for barbequing / entertaining. Main Level Master Bedroom features a Wood Pine Ceiling with custom lighting, a huge Master Bathroom with upgraded tile flooring, dual 48 in vanities with a 24 in linen cabinet, a free-standing tub and an amazing tiled Walk-in Shower with upgraded tiles including a Mosaic tile border. 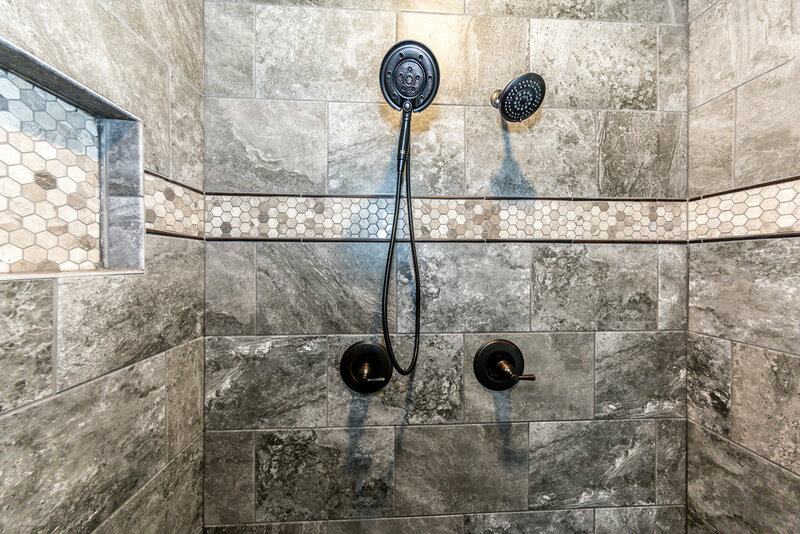 The 2nd story includes a Loft Area, a custom designed railing which overlooks the 2-story great room, two (2) large bedrooms with Walk-in Closets, and a full bathroom with a truly unique wooden shiplap wall, a linen closet and a separate area for the tub and shower. 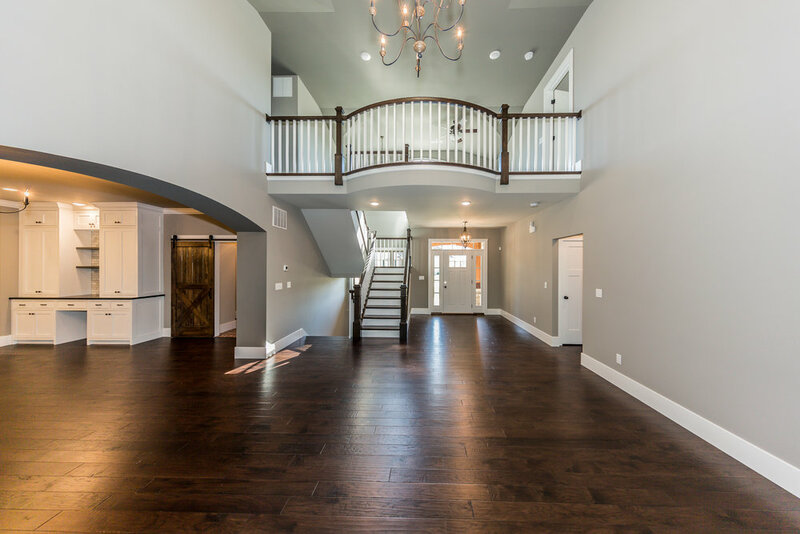 Experience entertaining in the finished Walkout Basement which features a Wet-Bar with Brick Pavers on the back of the wall, a large Family Room, a 4th Bedroom with a Full Bathroom, a Storage Area and a large 24x14 Flex Room which is perfect as a Game, Movie or Workout Room. Walkout to your private backyard through the lower level patio which has a stamped concrete pad. 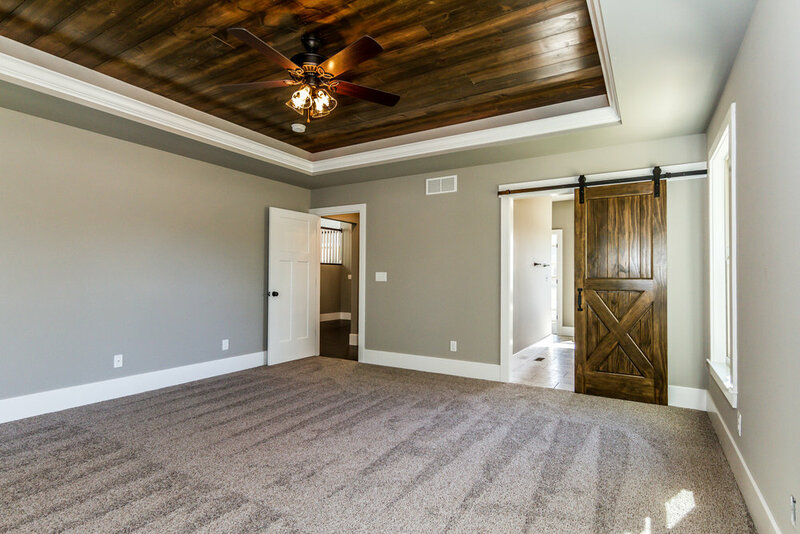 Other features include a 4-car Split Garage, Custom Wood Shutters, three (3) Barn Doors, Irrigation System, Zoned HVAC, Upgraded Metal Roofs / Wood Pillars on front elevation / Garage Doors, Elegant Lighting throughout the home and much more. 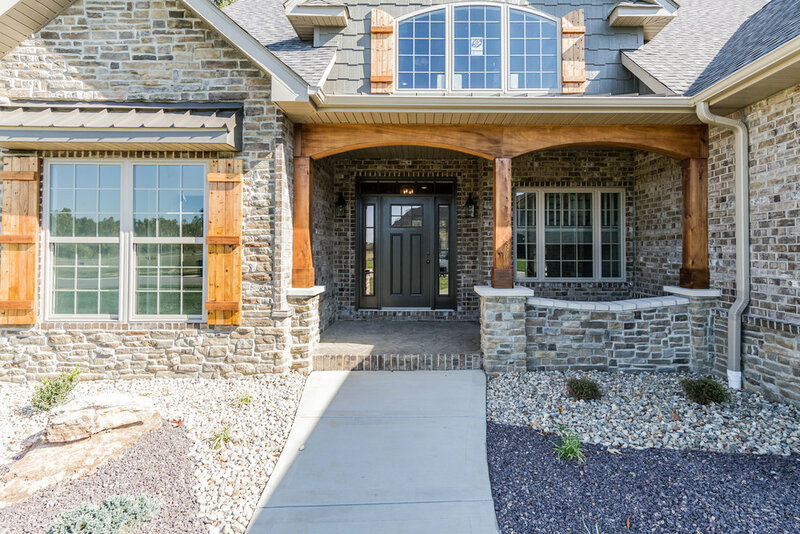 This home is located in Bethel Ridge Farms, a Rich Gorazd Subdivision in O’Fallon, Illinois. Scott Air Force Base is less than 5 miles away. O'Fallon is a city in St. Clair County, Illinois, United States, and one of the fastest-growing communities in the Metropolitan St. Louis area. O’Fallon was recently listed as the 3rd best city in Illinois to raise a family. O’Fallon was also recently ranked the 103rd overall best small city in America and 30th in education and health out of 1,268 cities with a population between 25,000 and 100,000 by WalletHub. The 2010 census listed the city's population at 28,281. The city is the third largest city in the Metro-East region and Southern Illinois. Due to its close proximity to Scott Air Force Base, the population receives a boost from military and federal civilian personnel, defense contractors, and military retirees. The city center is located approximately two miles east of the intersection of Interstate 64 and U.S. Route 50. Upgraded Lighting (including fixtures for undercabinet and puck lighting in kitchen and bar).